November 19, 2018 – Gerard wants to be known for being a helper who respects and loves everyone! This semester, he hopes to learn more about how he can show kindness in order to have a lasting impact! July 7, 2018 – The biggest challenge Gerard faces this last school year was his mother being sick. It was hard for him to not be able to be with her, but he continually prayed for her, and continues to believe that God is with him and is with his mother. This summer, his plan is to learn as much as he can about finance by volunteering at different organizations. He is also hoping to work on his videography skills, spending time helping his family and neighbors, and getting ready for the next school year! May 12, 2018 – Gerard values God and people, because they are the two things that have impacted his life the most! March 25, 2018 – When Gerard was younger, he wanted to be a soldier because of the political instability after the Genocide. In five years he sees himself as a servant leader in the community, and he hopes to be a famous filmmaker! Feb 27, 2018 – The most inspirational people in Gerard’s life are his mother and Anne. His mother refused to leave him alone during the genocide, and Anne raised him as her own child. Gerard is thankful for the skills he learned from her while growing up including education, professional, development skills and values. Jan 25, 2018 – An interesting book that Gerard recently read was about the Vietnam War. What stood out to him the most was how persistent people were. Dec 18, 2017 – The traditional food on Christmas in Rwanda is meat, and Gerard explains the women wear Imikenyero and the men wear suits! Gerard thinks the word his friends would use to describe him is “outgoing” since he is a very social and cheerful person! Nov 11, 2017 – This holiday season Gerald is thankful for his mother’s health, he is also thankful to be moving to the next year of university! He loves spending his Christmas holiday at home, visiting neighbors and practicing video making! Oct 8, 2017 – Gerard spent his summer at home with his family, he is excited to start school and to see his friends. May 25, 2017 – Something Gerard wishes more people knew about Rwanda is how the government works hard to support its people, especially orphans. March 28, 2017 – When asked about the 3 things he values most, Gerard said his mother, God and making friends! Jan 17, 2017 – Life isn’t without challenges. Last year Gerard struggled with a busy school schedule that made it hard to spend time with his family. Thinking of his future, he learned how hard work now will benefit him in the long run. 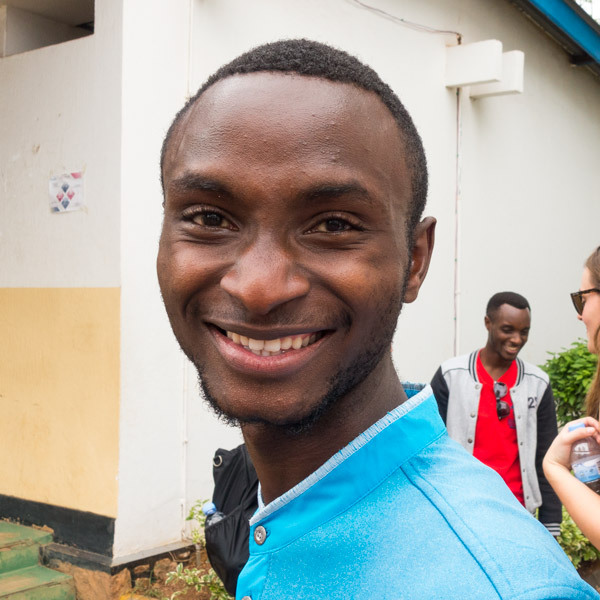 Gerard grew up with his parents and seven siblings in Rwanda’s Western Province. During the 1994 Genocide, he tragically lost his father and three of his brothers. The family struggled to meet their basic needs, and most of Gerard’s siblings had to drop out of school. During this time, however, Gerard kept reminding himself that nothing can steal his hope except for his own negativity and doubt. He continued to study and persevere, believing that one day he would become a leader who would care for his community. Today, Gerard is studying finance at university and aspires to become a financial manager one day.